Here at Di Vapor we try our very best to keep on eye with what’s on trend, without focusing purely on the bathroom space. Knowing what styles people look for around the home can often reflect certain trends that can appear in bathroom design. The growing popularity for glass shower enclosures generated the introduction of two new cabinets, The Verona & The Venice, meeting the need of glass construction throughout with modern design. Glass as a material keeps natural light as a priority, keeping rooms bright and welcoming. The need to keep our living spaces open and alight is reflected on a few trends that have taken hold this year. Having a well lit living space is something we all consider when it comes to home design, but sometimes we can often miss even the most basic principles. An ongoing trend that has fast tracked it’s way to the top is the need for professional lighting consultants. Experts with years of experience can take the space that you’re working with and maximise your lighting options, taking full advantage of the natural light available within the room. They can also advise on which light systems would suit your space best, whilst considering the best possible energy efficient option. Recent figures have shown that a rising demand in the use of manmade materials throughout the home has drastically impacted the number of options available to work with. In addition, manmade materials are often customisable, making them work well within your requirements at very little cost. New resin technology allows any base material to be wrapped in a 3mm thick liquid cement that sets silky smooth, remaining cool to the touch whilst visually maintaining warm natural stone tones. Kerlite is another manmade material wonder offering heatproof & acid proof properties whilst maintaining a high level of tensile strength. This non pourous material makes it a superbly versatile option for a surface top or splashback. Furthermore, the manufacturing process allows for a number of different shapes and sizes – No design is too extreme. We’ve seen it used in modern housing developments, replacing walls and supports for maximum light coverage – Using large glazed glass panels has quickly becoming a key trend for both the kitchen and bathroom. Large bi-folding glass doors to a kitchen allow for plenty of natural light to pour in, whilst offering an attractive entrance to a garden space. Using glass as a divider within a room such as the bathroom helps to divide the floor space without interrupting the flow of natural light. The rising use of glass as a feature over the last decade has quickly become a staple trend, set to continue strong throughout 2014. Current colour trends demonstrate the desire for natural colour tones pairs with blue & grey as supporting base colours. Accent pieces are back offering the more daring designer a chance to be loud without being too harsh. A splash of lime green or ruby red can quickly raise the mood of a room, whilst also offering a unique way to highlight small features. For a flawless tried-and-tested way of introducing colour, combine light neutral colours with a bright colour offering. Di Vapor offer a variety of shower cabins that provide an exciting and unique alternative to the standard shower enclosure. Whether you prefer being drenched by vast quantities of water from overhead, consider yourself a quick in & out shower person or someone that needs to be left alone for 30 minutes – Di Vapor define the alternative shower experience. We’ve decided to take a closer look at the current Di Vapor range offering you a detailed insight into some of the key products on offer. It’s easy to get lost in a long list of features from a multitude of different styles, but deciding on what’s important to you can be a good place to start. When looking for a new shower enclosure, what’s the most decisive factor for you? Possibly one of the most essential aspects when redesigning any showering space is deciding on your style – What do you want your shower enclosure too look like? Do you have a particular colour scheme to work with? Perhaps you have a shape in mind or are limited by certain work space restrictions? Picking a cabin with a style that suits your needs is the first step towards building your dream. 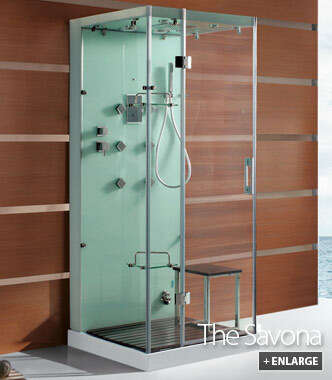 When it comes to style, The Savona leads the race as one of our most popular contemporary designed steam shower enclosures within the range. A straight lined glass construction throughout combined with low step entrance keeps the Savona the centre of attention. A sleek set of 6 massage jets across the back keeps things simple, whilst offering 2 different shower heads adds variety. Two words that sum up the Savona quite nicely: Sleek Simplicity. The bathroom has always been an important part of any home, offering basic practical needs on a day to day basis. However, many of us have began to utilise our bathroom as a space to relax and unwind, through the multitude of technological developments for the house & home. It’s never been easier to transform the basic bathroom into a home spa haven, complete with relaxing whirlpool bath and private sauna steam room. If maximum functionality and a prominent list of features are important to you, the Superior may be the choice for you. Offering a corner whirlpool bath complete with water & air jets, powered by individual built in pumps, soaking away the stress couldn’t be easier. In the same 1350mm x 1350mm footprint, you also get a fully functional steam generator with time & temperature settings, combined with FM radio and speaker system. A private steam room in your very own home – What more could you ask for? The most common constraint for any home renovation; How much money do you have to spend? Being limited by a sensible budget does not mean that you can’t achieve your dream bathroom. Di Vapor maintain a high level quality throughout the entire range, but the prices are not as high as you might think. Affordable options are available without compromising on features or quality. 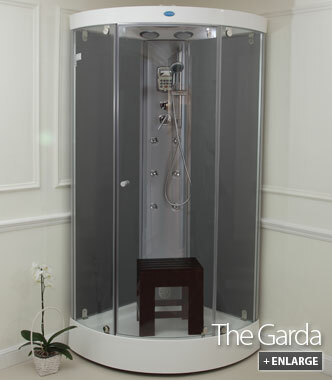 We’ve picked the Garda shower enclosure as a perfect example of this; Quality without the hefty price tag. For less than £1000, you can have yourself a completely free standing glass shower enclosure complete with two shower heads and hydro body jets. As an added bonus, this enclosure also comes complete with a fully programmable steam generator for private steam bathing. Who said that your home spa haven would never happen? With options like the Garda available, it’s never been easier. Whatever your limitation, we hope that this article has helped you understand how easy it is for you to have the alternative showering experience. Long gone are the days of glass shower screens & wall mounted electric showers – The alternative showering experience is available for everyone. 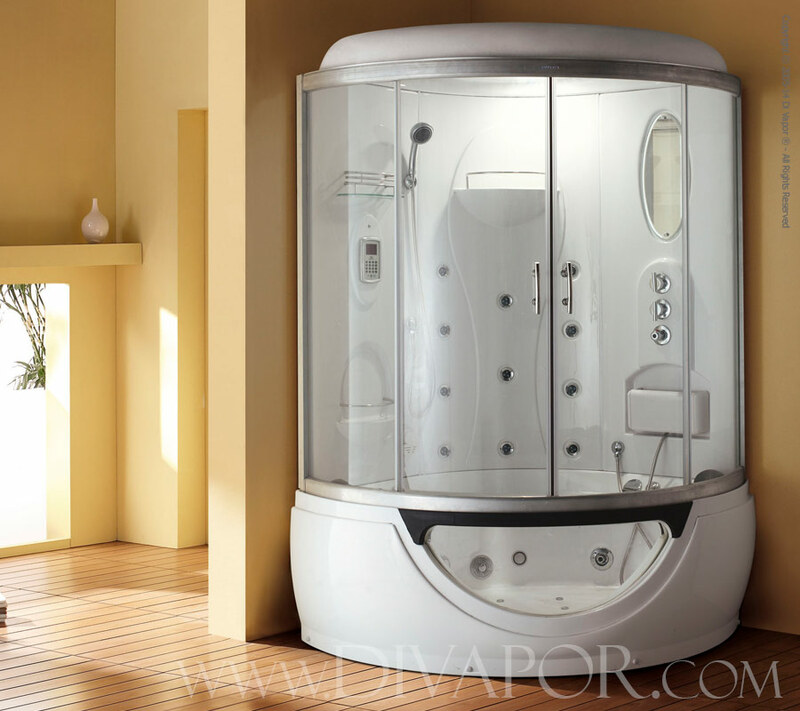 For more information on the unique showering alternatives offered by Di Vapor visit http://www.divapor.com today. Here at the Healthy Hideout we would like to wish all of our readers a very Happy New Year and prosperous 2014! We’ve decided to take a look at the top 6 bathroom trends that will sweep through homes across the nation, so if you’re short for inspiration on your renovation, keep on reading. They’ve been around for a long time, but the addition of second hand vintage fixtures and fittings can bring a much needed warmth of nostalgia to any room. With the 1920’s at the forefront of most bathroom renovations (think high wall mounted cisterns with a pull chain), you can be sure to see Buckingham Palace style elegance popping up on wanted lists. With a very much quiet introduction into the UK marketplace over the last few months, rimless WC’s are poised to make an impact on UK bathroom design. With a wealth of attractive designs, rimless WC’s are more hygienic & easier to clean when compared to conventional WC’s. When given the opportunity to install a frameless shower enclosure, many would find it hard to say no. Sleek seamless design combined with unobtrusive doors (or lack thereof) can make quickly transform a standard looking bathroom into a contemporary home spa haven. We saw a lot of pastel colours last year, complimenting the uprising trend of “up-cycled” vintage furniture. We predict that colour may take a bold turn in 2014, reverting to the ever reliable boldness that a monochrome black & white palette can bring. There’s been a strong prominence of gloss finishes in both bathrooms & kitchens over the last decide, but the abundance of matt finish options available for everything from tiles to kitchen worktops points towards another design shift for 2014. Other popular finishes & textures include linen & wood grain – great for feature walls or natural work surfaces. What do you think will be big in bathroom design this year? Be sure to tweet us your feedback @divapor – We’d love to hear from you. If you’re planning an upcoming home renovation project such as a bathroom or kitchen, you’ll quickly realise that funds disappear when not managed properly. Budgeting your project down to the last “nut & bolt” can be a menial task, but this attention to detail can save you headaches in the long term. Many people turn to a home improvement loan when it comes to financing a renovation, with many banks offering competitive products that are quick and easy to apply for. They work in the same way a personal loan would, with different banks offering different deals depending on your circumstances. As with anything, shop around for the best possible interest rates as they can vary from 5% – 8% depending on your credit rating. Providing you tick all the boxes, you’ll get the money straight away so your project can be finished quickly and efficiently. With an abundance of suppliers in the marketplace, competition has never been stronger. Many retailers now offer their own versions of finance deals to help make your dream kitchen or bathroom become a reality quicker than you’d expect. The interest rates are often very low making retailer finance an affordable option for anyone, with some of the larger retailers offering 0% finance on complete supply & fit options. Many of us would instantly turn our noses up at credit cards, branded with the image of high interest rates and unrealistic minimum payment options. However, credit card companies have changed their methods in a fast track way to attract new customers, offering 0% interest on purchases for those with strong credit ratings. Be sure to pay off your amount within the grace period (or switch it to another card) as you may face interest rates of up to 25%. The previously mentioned options are all quick and easy ways of getting your project started, but some people now are utilising low interest rates as a way of paying for large projects. By re-mortgaging your home to suit a better finance deal, you’ll often find yourself with a larger source of funds to work with. This isn’t a quick option however as the entire process can take time, not to mention potential fees which can be upwards of £500.00. At the risk of not confiding with the ways of modern society, you could always plan your project well in advance, using good old fashioned saving to gather the necessary funds. It’s the way it’s been done for many years before the dawn of credit! Put away a little each month for a set period of time to pay for your renovation, leaving no trail of credit repayments when you settle down to your first hot soak in your new bathroom. There is no better feeling! How did you plan for your project? Let us know on Twitter @divapor or visit our newly renovated Facebook page! Maintaining a healthy diet is just as important as exercise when it comes to practicing a healthy lifestyle. Many of us are looking at new ways of introducing healthy super foods into our diets, but as our days become busier and schedules become booked up, it’s easy to pick up the wrong kind of snack foods. Say no to doughnuts and crisps and grab yourself a handful of powerful punchy Pumpkin seeds. Not only are they deliciously more-ish, they’re easy to transport around with you during a busy working day, whilst being widely available in ready to eat packaging. Be wary that they are high in calorific content, so moderation is the key (as is the case with everything). Here are the top 4 pumpkin seed benefits which demonstrate why the pumpkin is the pumpking! The naturally high level of L-trytophan found in pumpkin seeds have been shown to calm the nerves and maintain a “calm mood”. Ease your stress levels by munching on a handful of the “pumpking” seeds and taking a 5 minute break from your desk! Pumpkin seeds contain a high level of vitamin E, preventing the early breakdown of skin cells. This helps to maintain a youthful looking glow whilst combating high levels of UV found in the sun. Perfect accompaniment for those in a warmer climate. Packed with phytosterol, which help to reduce cholesterol levels, toasted seeds contain healthy compounds that help to reduce LDL cholesterol levels. This increases your immune response whilst helping to decrease the risk of certain cancers. Packed with high levels of protein and fibre, the pumpkin seed is great snack to turn to for a quick fill me up. There’s nothing quite as satisfying as a handful of toasted pumpkin seeds, seasoned with a dash of salt!